For a long time I couldn’t sew. As a teenager in school my sewing teacher would throw her hands up in the air when she came to check on my work. Despite her giving up on my complete lack of crafty skill I was still very creative. When I grew up I became a theatre director and acting coach, fuelled by my love of storytelling and history. When I had my first child, his room needed more colour. So I learnt to operate a sewing machine and sew a straight line whilst adding bright patchwork pieces to the tab curtains in his bedroom. 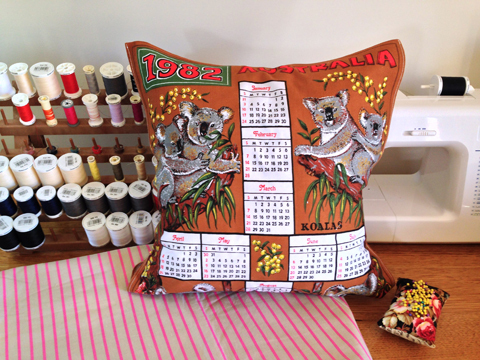 Having caught the sewing bug, my husband, young son and I then moved overseas for six months. A stranger in a strange land without a sewing machine! That was difficult because now I was hooked. 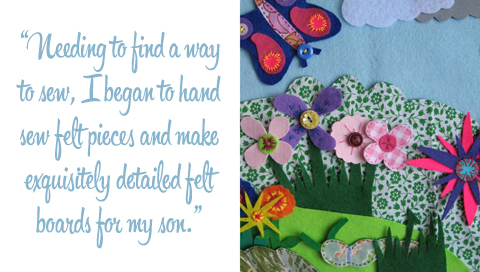 Needing to find a way to sew, I began to hand sew felt pieces and make exquisitely detailed felt boards for my son. Those felt collections went everywhere with my 3 yr old. I’ll never forget having expat drinks at a huge palazzo in Florence one evening. Perched in a corner of the party was my son, busily at work creating scenes on his felt board. It kept him amused for hours. After returning to Australia and having more children I wanted to brighten up our space again. So I put my rapidly improving sewing skills to work, making cushion covers from vintage linens and tea towels for my sofa and arm chairs. 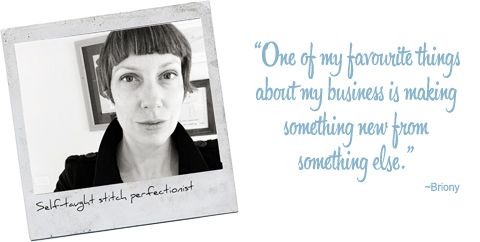 What began as a personal project, blossomed into a much beloved part-time business. I still work as a director and acting coach, whilst operating my business out of my home studio. 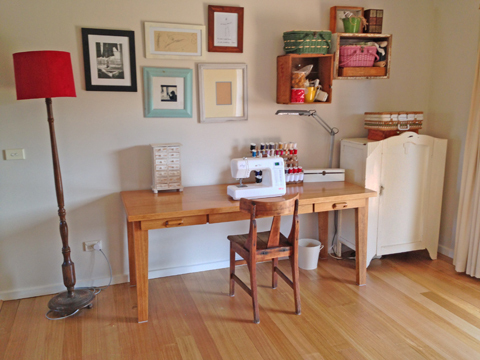 I sew at my custom-made table, built by my amazing father-in-law. My kids play cars around my feet or interrupt me for a picnic lunch outside. Life is full but I chip away at my work in small production lines, and it’s working very well for us all. One of my favourite things about my business is making something new from something else. Most of the linens I use are from the 1970s and completely untouched. Some of the designs I use are still in circulation, however they are now made with cotton. The 1970s linen is no longer produced. 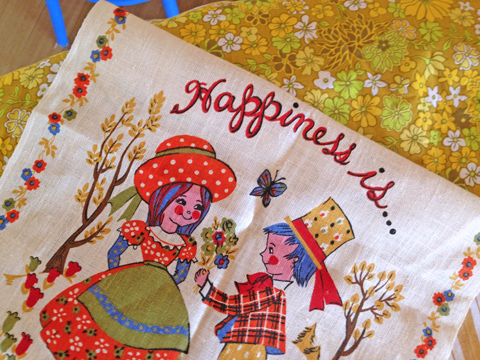 Which means many of my cushion covers made from the 1970s linen are acting to preserve a vintage artefact. 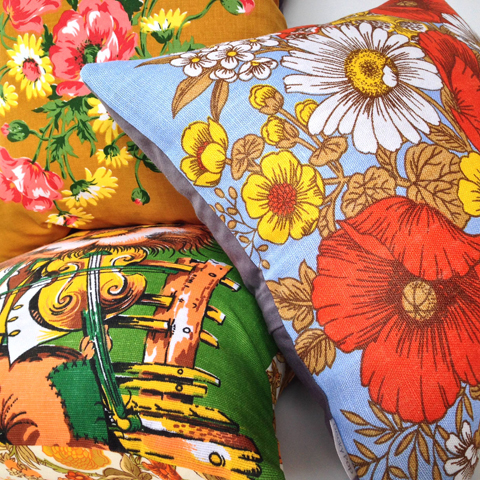 To me, creating beautiful home décor is a way of celebrating their historical specialness. I love this journey, the experience of time-passing sitting on your sofa. The storytelling and conversational appeal is another element I love about the covers I make. I like living spaces to be bold and brave as well as cosy and welcoming. 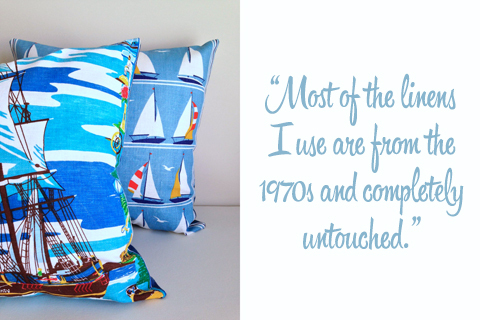 To me, that means cushion covers that pop; colour, movement and conversation. That’s what my handmade covers are about. 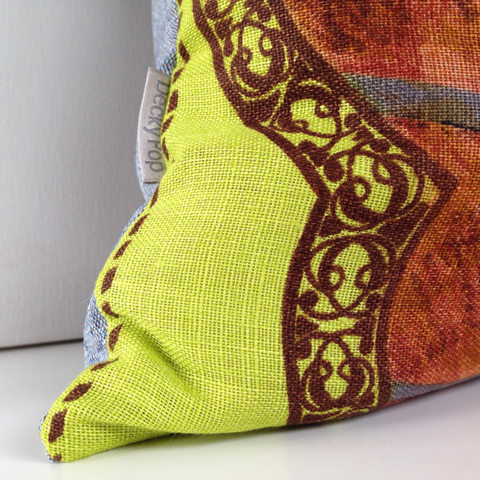 Every time I search for a backing fabric to match the front of a new cushion cover, I use as inspiration, an imaginary customer’s house that the finished item will suit perfectly. A challenge about selling online is I never do find out if I have imagined the correct living room my cushion eventually calls home. 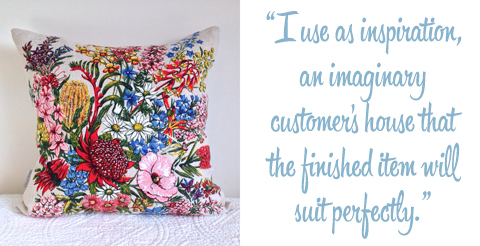 The personal, handmade touch is very important to me in my work, and I am very fussy about the quality of my items. I have been known to unstitch multiple times when my seams and labels are not straight. To me, this is what the term ‘handmade’ implies. Not simply that an item has been ‘made with love’. But rather, it has been made with a respect for craftsmanship. Yes, it is beautifully intimate if we see evidence of the individual artisan in the work. However, we should also be able to identify a discerning eye and quality assurance. This is what ‘handmade’ means to me. 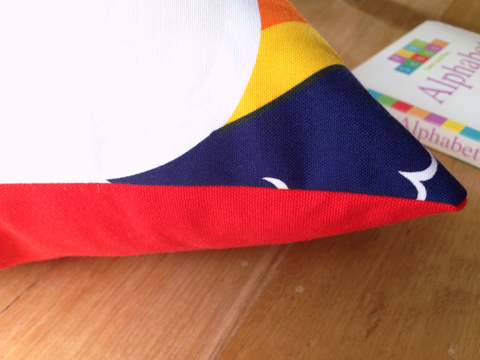 And what about those patchwork curtains where I learnt to sew a straight line? I’m afraid to say that compared to my high standard of quality these days, those curtains just don’t make the grade. They occasionally get pulled out of the cupboard to be used as outdoor stage drapes when my kids want to put on a play.